More often than not, track and field athletes are viewed by the general public as focused individualists, relentlessly striving to improve their personal performances, pushing their own boundaries for the distinction of standing alone on the podium’s summit. But track and field is a team sport, as well. Lynn Swann, the University of Southern California’s athletic director, recently reminded those assembled at the school’s annual “Out of the Blocks” track banquet just how important a single point can be. He began his praise of the newly–crowned 2018 NCAA Division I Women’s Champions by acknowledging Madisen Richards. It was Mady who put up the team’s very first point with her eighth–place long jump PB of 21' 2-1/2" (6.42m) on Eugene’s Hayward Field. At that time, the casual observer might never have imagined how critical that single point from the lithe co-ed would become. While most would fixate on the white–knuckle, come–from–behind 4x400m finish courtesy of Kyra Constantine, Anna Cockrell, Deanna Hill and Kendall Ellis, that win still would not have been enough to clinch the team victory. Only two points separated the top three finishing teams of USC (53 points), Georgia (52) and Stanford (51). USC’s Coach Caryl Smith Gilbert reflects on the import of Mady’s contribution to the team effort: “It was absolutely awesome. We would have ended up in a tie, without that one point. Years of preparation had gone into Mady’s golden point. 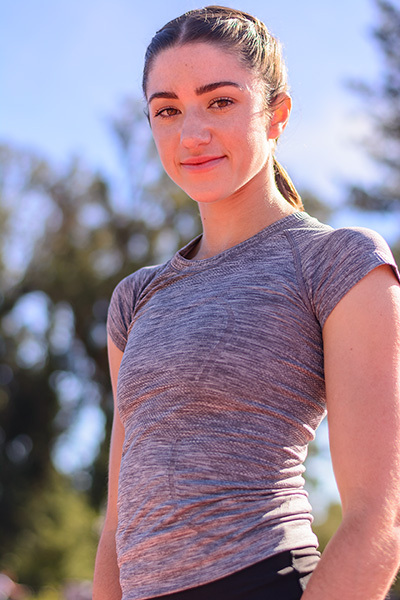 The pre–med student athlete got her start in youth track at the age of seven, sprinting, and then long jumping for the Simi Valley Running Rebels. “I was super competitive as a little kid,” recalls Mady, who, at ten, set a goal of jumping 13' and pursued it intensely, hurrying home after Saturday dual meets to check the database for results from around the conference. Mady learned how to set and achieve her goals. She also learned that often, success did not come without old–fashioned hard work and perseverance in the face of adversity. Although her high school athletic career started out with a California Interscholastic Federation team title in her sophomore year, Mady struggled through a “horrible” junior year. “I did not make it out of CIF prelims, I was so upset,” she says. Mady was able to break the curse, coming back in her senior year to qualify for State. “I wanted to make it to the podium… I made fifth and got it. I was about 5'4" and not even 100 pounds,” she says. 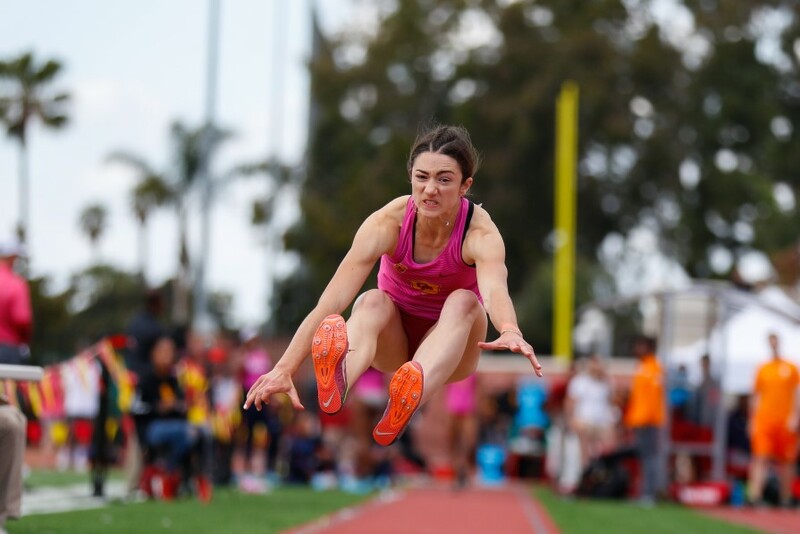 “I didn't have a lot of power because I was super–tiny.” All in all, Mady racked up a total of two Ventura County titles, three Marmonte League titles and a PB of 19' 7-1/2" (5.98m) by the time she graduated with honors (4.0+) from Simi Valley High School in 2014. At USC, Mady’s pattern became eerily similar to that of her high school experience. She won her very first collegiate meet, the CSULA Invitational, and later that first season re-set her PB with a jump of 20' 1-3/4" at the Florida Relays. Then, sophomore year, another set–back: Mady was warming up before her event at the Washington indoor meet, and on the fourth or fifth pop-up, an audible “snap” signaled a broken fibula that would confine her to a boot for six weeks and take her out for most of that season. Junior year found Mady still dealing with the psychological aspects of attempting a come-back, but she kept pushing forward, determined to rise. Finally, after finding a training program that clicked for her, Mady was back in the game, opening her final collegiate outdoor season with six PBs in her first outing. She would go on to finish second in the PAC-12 Championships, and earn her All-American designation with that eighth-place NCAA ranking and that one, valuable point. Under the guidance of Coach Jeremy Fischer, Mady currently lives and trains among the stars at the U.S. Olympic Training Center. With training partners like Brittney Reese, Kylie Price, Aasha Marler and Danylle Kurywchak, Mady is well positioned to progress toward her next goals: Berths on the next U.S. World Championship and Olympic teams.